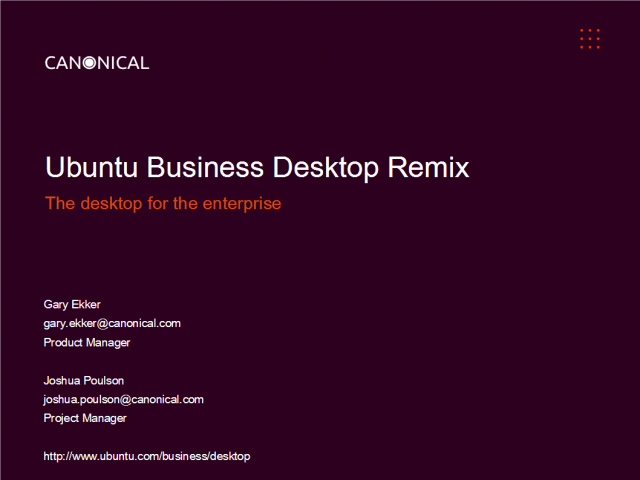 Ubuntu Business Desktop Remix is a starting point for large-scale corporate desktop deployments. It is inspired by a review of common changes made by IT departments deploying Ubuntu at scale. The result is a simple base image that can be deployed into your corporate environment or used as a starting point for further customisation. Join this live webinar with business desktop product manager Gary Ekker and learn what Ubuntu and Canonical can do for your business. Traditional development methods do not scale into the IoT sphere. Strong inter-dependencies and blurred boundaries among components in the edge device stack result in fragmentation, slow updates, security issues, increased cost, and reduced reliability of platforms. This webinar showcases the use of Ubuntu Core and snaps as an alternative to the existing model, with a strong focus on isolation, reliability and an accelerated development cycle. Join Canonical Product Director Stephan Fabel and Ubuntu Product Managers to discuss everything new in Ubuntu 19.04 ‘Disco Dingo'. The latest Ubuntu update was developed with a focus on security and makes the latest open source software accessible to developers and innovators so they can accelerate time to value. 19.04 offers the first chance to experience the Linux 5.0 kernel, OpenStack Stein and the latest Kubernetes version 1.14. Alongside these updates Ubuntu 19.04 contains productivity improvements focussed on eliminating friction on existing features and enabling enterprises to operate at speed and scale. This webinar presents an introduction to Charmed Openstack whilst discussing the common security issues and scenarios faced with O7k in production, the impact it has on LCM and the importance of full automation. Learn how Canonical's approach to O7k allows implementation of advanced security features while not impacting the ability to upgrade and LCM the underlying codebase. AI and ML adoption in the enterprise is exploding from Silicon Valley to Wall Street. Ubuntu is becoming the premier platform for these ambitions — from developer workstations, to racks, to clouds and to the edge with smart connected IoT. But with new developer trends comes a plethora of new technologies and terminologies to understand. ∙ What do Kubeflow, Tensorflow, Jupyter, Edge AI, and GPGPUs do? ∙ What’s the difference between AI and ML? ∙ What is an AI model? How do you train it? How do you develop / improve it? How do you execute it? Need to get up to speed with Kubernetes? This webinar will give you the primer to the Kubernetes platform that you need. You’ve probably heard that Kubernetes is great technology, but have you considered how you can use it in the enterprise? We’ll give a comprehensive overview, demos, and even ideas into how it can be used in your business! Security remains the number one concern when designing and deploying IoT devices. High profile breaches continue to occur and concerns cease to subside. For any organisation, security needs to be front of mind and considered from the start - not as an afterthought. Having no mechanism in which to address security concerns can be as significant as threatening the survival of a business. Many organisations have adopted Ubuntu Core to help manage the security and integrity of their IoT devices. Ubuntu Core features leading security credentials and protects against online threats. However, with many IoT devices deployed remotely, how can organisations ensure protection against physical access and the data on those devices? This webinar gives a technical overview of how Ubuntu Core with full disk encryption and secure boot can be implemented to provide protection in such scenarios including a case study of this in practice. Many enterprises still run Ubuntu 14.04 LTS, but this release will be moving from Basic Security Maintenance to Extended Security Maintenance in April as the release transitions from the five-year LTS maintenance window. While updating to the latest version of Ubuntu LTS release is recommended, updating can be an operational concern for some, particularly those with larger deployments. 1) Key technology areas, highlighting some of the popular implementations. 4) Demo of using the reference tools - due to time constraints, this will be similar to cooking shows - we'll demonstrate the start, and the end. This webinar will leverage Ubuntu, Kubernetes, Microk8s, and a host of CI/CD technologies like Jenkins, GitLab, Spinnaker. The traditional approach to monolithic software flashing of devices at the manufacturing stage is not sustainable in the IoT era. Organisations need to take a more long term and future proofed view. In this webinar, learn how the use of an IoT app store can create a customised software portfolio for devices to address security concerns, whilst also supporting the addition of new features and the reduction of support times. The webinar will also cover the different types of stores available, how software updates can be managed in a scheduled manner and permissions set for different users. Ubuntu Core is a tiny, transactional version of Ubuntu for IoT devices and large container deployments. It runs a new breed of super-secure, remotely upgradeable Linux app packages known as snaps ‐ and it’s trusted by leading IoT players, from chipset vendors to device makers and system integrators. In this introductory webinar you will learn about the latest version of Ubuntu Core, snaps, and how they all fit into the IoT. Modern software is becoming increasingly complex as data streams from a variety of sources, creating an opportunity for organisations to automate and gather this information into valuable insights. Spicule and Canonical have come together to power these real-time analytics, bringing you the easy to use, customisable, flexible data platforms developed by Juju experts, that can be modelled and deployed on any cloud based application through open source technologies. Companies across many industries have adopted the cloud computing paradigm, leveraging OpenStack to manage private clouds. But what happens when first generation environments become obsolete, non-upgradeable and exposed to security vulnerabilities? Trilio and Foundation Cloud Build from Canonical help define the migration path connecting the old with the new. In this webinar find out how organizations can transition to new, maintainable cloud architecture in just weeks with Foundation Cloud Build, so you can continue running operations with minimal downtime and full support. Apellix creates aerial robotic systems to eliminate the need to place human workers in potentially dangerous scenarios such as oil refineries. Apellix's aerial drones are designed for a range of applications including safely applying chemicals, painting buildings, and more. In this webinar, find out how Apellix - using Ubuntu - has designed aerial drones with custom software to enable precision flights at the edge of innovation. Using Apellix as an example, discover how the right software stack can be used to solve everyday challenges in an IoT era. Whether it is HIPAA, MiFID II, PCI or the GDPR, compliance and security regulations are a top of mind priority for businesses of any size across any geography. Businesses expect their technology to meet certain regulatory standards, such as FIPS 140-2, DISA/STIG, Common Criteria, or to have achieved minimum requirements such as CIS Benchmarks or MSPCV. Knowing that the technology your business has put in place can help it to be compliant is an important factor that decision makers must consider. For Ubuntu, compliance means being able to best serve our customers. Technologies such as Landscape can ensure that there is no case for gross negligence under GDPR if you are hacked, because it will have ensured the latest patches are in place. Ubuntu’s trusted security and compliance solutions are at the forefront of solving these issues across a wide range of industries. Join Canonical product director Stephan Fabel alongside product managers Joe McManus and Carmine Rimi to discuss all things new in Ubuntu 18.10. The latest software release from Canonical focusses on multi-cloud deployments, AI software development, a new community desktop theme and richer snap desktop integration. This webinar will feature a live Q&A session so you can ask any 18.10 related questions to those who know it best. Learn how to get started with AI/ML on Ubuntu with this webinar that will walk you through running a Kaggle experiment on Kubeflow on Microk8s on Ubuntu. These highly reproducible instructions can be used for any machine learning exercise, in addition to any Kaggle competitions. You’ll be able to run your experiments locally or in the cloud. In this webinar, join Canonical’s Kubernetes Product Manager Carmine Rimi for a demo with instructions for everything from Ubuntu, with multiple examples of how to get an AI/ML environment on Ubuntu environment up and running. At the end of the exercise, you’ll end up with a summary of commands needed to quickly and efficiently launch your machine learning environment. Fing App is a network scanning and troubleshooting tool used by millions. Fingbox is a complementary hardware device which plugs into Wi-Fi routers to monitor, secure and troubleshoot networks and their connected devices. Fing's engineering team built Fingbox using Ubuntu Core and Snaps to speed up development time, save budget and resources and ensure a future-proofed product went to market. Initial development speed was massively improved as Fing engineering resources could concentrate on building product features for our users and not on OS/platform development as this comes ready to go with Ubuntu Core. The ability to upgrade seamlessly within hours was fundamental during the Fingbox product launch phase and it’s as important now that the product is in production. In this webinar, you’ll hear from Fing Co-Founder and Big Data Architect, Carlo Medas, on how Fingbox was built with Ubuntu Core and how Fingbox’s key features including parental control, Digital Fence and Digital Presence are updated and improved ongoing using Snaps. Huge technological breakthroughs have been made over the past few years, with the rise of Artificial Intelligence, Blockchain, containers, Kubernetes all becoming ‘must-have’ technologies. There’s increasing pressure on financial services to change and roll out , but how do they start? Get the most in depth information about the Ubuntu technology and services from Canonical. Learn why Ubuntu is the preferred Linux platform and how Canonical can help you make the most out of your Ubuntu environment.